← Girl [and two boys] on a train. From miserable to mighty in 24 hours. I reached out my hand for the bin bag only to realise it was a baby in a car seat. In a rare fit of practical action I was helping sort donations for ‘migrants’ in the Calais ‘Jungle’ encampment. The British government’s most visible contribution has been the ‘National Barrier Asset’ – a high fence designed to withstand terrorist attacks. But not quite so effective against desperate people with ladders. A cheerful, chatty, almost unnaturally positive young woman had earlier welcomed my friend and me into a large, old detached house in which she runs a business focused on mothers, babies and well-being. This bubbly, generous person has made two rooms available for sorting and storing donations that big-hearted people are bringing in – for strangers, living in miserable conditions, hundreds of miles away. Clusters of tents, kettles and sleeping bags,. Piles of jackets, trousers and trainers. Stacks of food, batteries, toiletries – and toothbrushes galore. People began to arrive. 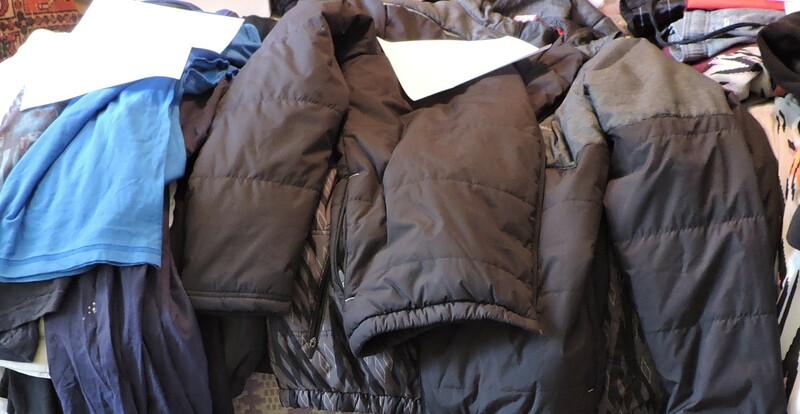 A couple sounding on the ball – ‘You wanted men’s clothes, didn’t you?’ – turned out to have donated all sorts of items, including children’s clothes, many covered in dog hair, but, hey, they also gave tinned food. My sensible friend had brought plastic gloves for us to wear – and soon mine were grey. I’d been up and down the stairs several times (sorting downstairs, storing upstairs) when the baby arrived. So to speak. I laughed at myself and, instead of the baby, took an armful of re-sealable plastic bags off the mum. She’d carefully packed each one with soap, facecloth, antiseptic gel, tissues – ready-made personal hygiene bags. Yes, this woman, with her young baby, had gone out, bought stuff, packed bags and delivered it, all with her little one in tow. Many of the donors were mums and dads. With or without offspring in tow. A wiry, dark-haired chap in shorts and his pretty female partner brought bags and bags of good, clean, medium-sized menswear and shoes. Top items on the required list. ‘I’ve got no clothes left except what I’m stood up in,’ he joked. I could believe it. He used to play for Everton, it turned out. My friend’s a fan. Probably made her day. We were there just two hours, but I left feeling a sense of – what? Not achievement. Anyone could have done it and it wasn’t frantically busy. I suppose it was just seeing that so many people were concerned for the plight of the poor people stuck in that nightmare of a place. Concerned enough to do something. It felt good knowing that braver people than me can drive there, stay over, help clean up the mess that living humans make when civilisation lets them down. Then, as I sat, later, watching television – alone because Anthro-man’s been at an anthro-conference – there was yet more grim news. The presenter in Greece broke off to try and catch a baby falling to the rocks on the beach beside him. Is that baby a refugee, or a migrant, I wondered? I had a disturbed night, punctuated by strange dreams. I awoke feeling distressed, inadequate – and frustrated. What could I do that would make anything better? I went and stood in the spare bedroom. 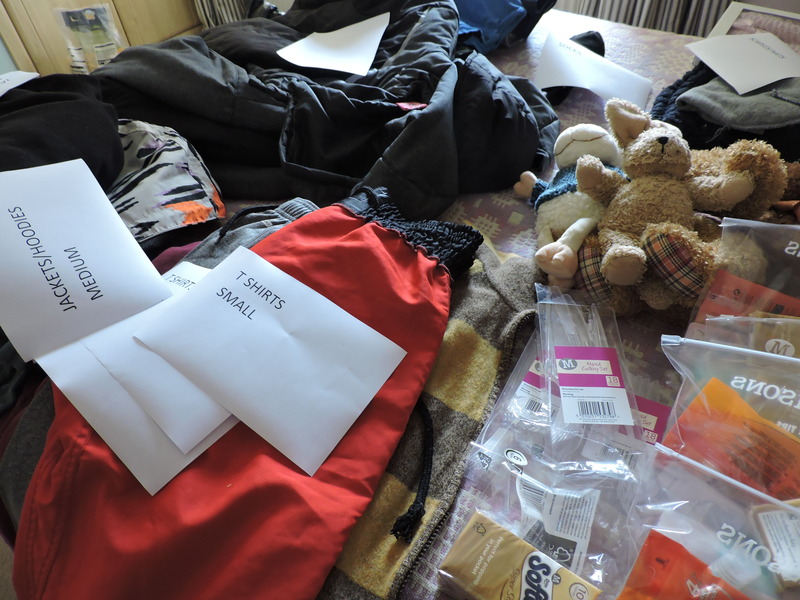 The bed’s slowly disappearing under donations I’ve picked up from others, organised and begun to label, ready for delivery to a collection point. I remembered there was a load still in the car from a lovely couple who’d really put some thought into it – not just warm and waterproof clothes, but a wind-up torch and radio. I told myself to stop being feeble. Checked Facebook to see if anyone needed me to pick anything up. I’ve put the link at the end of this post – I challenge anyone to read the two short accounts of the Jungle written by Cassy Paris and not be moved. Do you ever hear that in your head? I do. I think, often, of the women in this picture. I didn’t want to embarrass them by being obvious. I took it from a moving vehicle, that’s why it’s so bad. 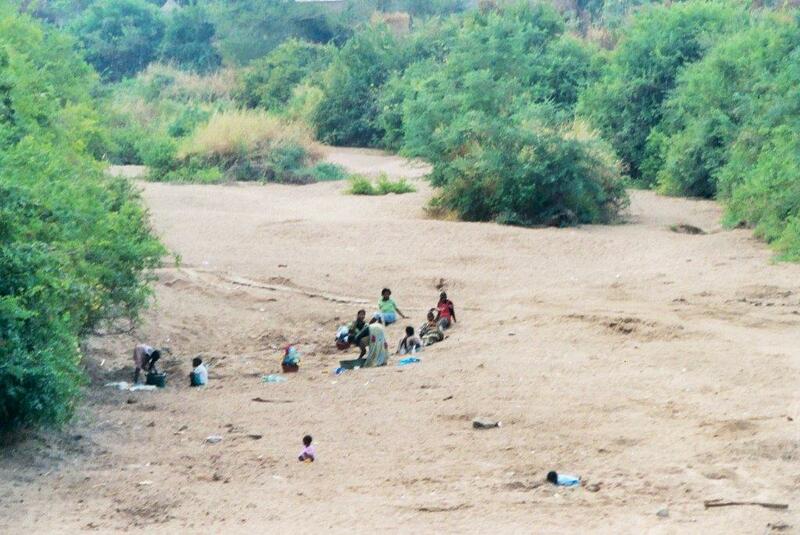 Women and a girl are digging in the dry river bed to reach water beneath the surface. They’ll do some washing, then maybe carry filled containers home on their heads. If I’d been born there – Mfuwe, Zambia – I’m pretty sure I’d be dead by now. I’d probably have borne many children. Possibly had a rudimentary education which wouldn’t have stopped me working in the fields. I’d probably have spent my life sleeping in a one-roomed hut, shared with my family and mosquitoes. Children, siblings, parents, aunts, uncles – some at least would have died of malaria, HIV Aids, TB. My husband might have lazed around while I worked in the fields as well as cooking over an open fire. My neck might be permanently damagedafter years of foraging for wood, walking miles with heavy logs on my head. And containers of water. If I’d been born there, not here. That’s the big difference between those women and me. Those ‘migrants’ and me. It’s too late for me to join an NGO, to be a proper journalist, or a doctor, to do anything other than donate. And this blog-writing business feels like idle self-indulgence. No-one out there heeds what I say, does anything different because I write. Yes, it gets it out of my head, but doesn’t change anything else. Such helplessness, while so many people facing hopelessness need so much. No cutesy ending this time. please, follow the link below and read the two short posts. Then tell me, what can we really do, we citizens, while our government builds big fences to keep these scroungers out. This entry was posted in Thinking, or ranting, or both and tagged CalAid, Calais, Cassy Paris, Charity, fence, migrants, National Barrier Asset, refugees, there but for the grace of God go I, women, Zambia. Bookmark the permalink. And think of the ones left behind. The ones who are not lawyers, teachers and photographers who don’t have the know how and money to pay coyotes for a ride in a rubber raft with 60 other people. Maybe don’t think about it. Lou, thanks for your two busy hands. A very moving story indeed, especially the links which I read to the end. You should be proud of your generosity, that of so many British people, in trying to take action to help the migrants – whether ‘real’ refugees or not. As for me….so far I am all talk. But full of empathy. ‘There but…’ often echoes in my mind; so much of our lives is nothing more than an accident of birth. Thanks for sharing this thought-provoking post! And thank you for reading all the way to the end and the links, ME – a long read. I enjoyed your very different approach, found it reassuring in my slough of despond! As for being all talk – well, it’s hard to know really how we can make any difference. Disaster often brings out the best of people. Every little bit – every human kindness helps. And next is vigilance that the ones at risk do not get grabbed up by those of harmful intent and those who ignore their own humanity and take advantage of the displaced. I have to go on, later, to read the links, and I will then be back but first some reassurance… by simply believing and expressing via whatever medium what you say is important to do because that’s the basis humanity and care stands on. Thank goodness for people like you and Cassy Paris and others like us who say something and do something about refugees, and other things that need something said and done about them usually, who don’t judge or act solely from what the TV, newspapers or their jobs tell them, or their political advisors recommend, or comfy lives unjustifiably feared under threat. I try to understand those who do, I really do. But more, I understand the frustrations of people who think like we do. For us there is no Them. I spent some time volunteering at an asylum seekers centre, and also at a detention facility a decade ago… before access was rescinded. Like so many issues past and present, history will judge our actions… and then be forgotten by most next time we need its perspective. I went to a local political meeting last night for the first time – I am no good at keeping quiet till it’s my turn when I want to chip in, it was torture! – but as an indirect result this morning people will be coming round with donations and now several people know where other donation centres are that they hadn’t been aware of. Things happen as a result of people, I can see that, it’s encouraging. I am interested about your volunteering as I think that is where I go next in Liverpool. Thnaks, Dee, also, for understanding not just how awful it is for the refugees but also how I am feeling too! Bewildered I think sums it up.